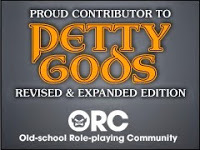 Six years or so......<insert mental commentary about aging> ago I posted a graph paper generator as a Free GM Resource. Now there is nothing wrong with that source for grid paper, but if you want something even simpler, Gridzzly is about as simple as simple can be. You see the lead-n graphic there on the left? Yeah....that's the entire interface. Click on one of seven types, use the slider or enter a size in the box, one more slider on how dark your lines/dots will be and click on print. 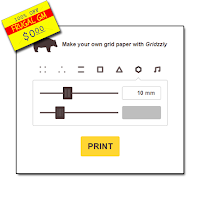 Gridzzly is super quick & easy to use...check it out today! I just found this, thanks to you! I do travel journals and this website is great for printing dotted pages. Very easy. Thanks again!